I ruptured my Achilles tendon playing pickleball in mid-August 2018. I opted for the conservative approach and was put in a regular cast for three weeks. After this time I used an Aircast boot. I started physiotherapy on September 11 and followed the Fowler Kennedy (accelerated function rehabilitation therapy) and was very pleased with the result. I was able to discontinue the boot on November 16 and resume normal living activities including driving. I can now stand on my tippy toes again which is great! I had the operation for ruptured Achilles tendon, 4 weeks cast, and 2 weeks boot. Weight bearing started under physio supervisions at this stage. At 8 weeks I am back cycling a modest distance. I am walking with a slight limp. No pain at any stage. Swelling still occurs. I have heel pads in my shoes. Reading first several comments I understood I am the lucky one. I had my surgery 2 days ago. It was almost a full rupture of my Achilles tendon. I am already jumping around the house. My feet is in the boot, I can step on it but of course not full weight. I am using 1 crutch. Not sure if it's right though. I had surgery with epidural anesthesia which was active for like another 18 hours after surgery. Then they cut it and gave me only 1 shot of painkiller. Recovery after surgery for ruptured Achilles tendon has been challenging. After surgery I was not prepared for the intense pain when pain block wore off. It took at least 24 hours to get ahead of the pain with medication, scary trying to figure out how much pain medication is too much. I had to see a behavioral health therapist to help me manage my mental health as my whole life changes due to injury, surgery and recovery. I have to keep my mind healthy in order to make it through recovery successfully. I had my operation for chronic Achilles tendon rupture in April. I had a plaster cast for a month, no weight on it, so was crawling around the floor. The stitches were taken out, then I had a boot for twelve weeks. I gradually applied weight, and today I tried walking without boot. There is still a lot of scar tissue which you must moisturize. I have physiotherapy this week, so thinking positive. I am 2 days after an operation for ruptured Achilles tendon. I had lot of pain for the first 36 hours, then codeine reduced the pain. I am in a bandaged splint from toe to mid-thigh, so limited mobility. First wound treatment is after one week. I will report further progress but told no weight on foot for 8 weeks. I am an active registered nurse, working and walking 12 plus hour shifts, and have been active cycling and hiking since I was in my 40s. I fell unexpectedly in the dark from 3 ft. height off my entry porch to my house. My left foot was free stepping and I landed full force on the left foot. I had pain and numbness after fall, with sensation of walking on waves, front and back as I finally entered my house unassisted. I iced it, put a hiking boot on and worked next day, limping. I flew next day to a job in California, worked three 12 hour shifts side stepping in hiking boot, before I went to an orthopedic surgeon, specialist in ankle and feet. He opted for cast, no surgery, no MRI, nothing. The next day I went to a podiatrist who removed that cast, ordered MRI, and we found out it was a complete Achilles tendon rupture, and scheduled surgery in 5 days. Total time 17 days before surgery (March 26 until April 12). Now 8 weeks later, after casts 3 weeks, and 4 weeks, I am in boot, with crutches. The skin is extremely sloughing off entire area of casting, and the incision top 3 inches is completely great, but the last one plus inch closest to heel is crusty and still scabby. I have 4 more weeks in boot, without exercises or weight bearing. Disappointed, but know that older adults heal slowly. I am very active and hope to return to work, and cycling and hiking. Maybe 3 to 6 more months. First let me say I am no athlete. Although I have been very athletic in my lifetime, not now. So to have this injury is a mystery. I do have a demanding job that requires walking 90 percent for the last 12 years. My Achilles tendon injury was diagnosed several years ago as partial tears. After 6 weeks in a soft cast and no weight bearing to let it heal, I kept going on with my normal activities (5 years). This was a really bad decision. The pain and swelling was horrible most times and I was constantly guarded with every movement. I began taking naproxen here and there just to get by. Well, eventually I had run into a wall. The swelling would not go down and the pain became burning and aching constantly. To make matters worse, I also had a very large bone spur aggravating the exact location. Finally, after much suffering, I couldn't take it anymore. Just like any normal working person, you just don't want to go through the long recovery. Well, I had surgery on January 8. On January 14, surgical dressing was removed and hard cast applied. On January 28, sutures removed and another hard cast. February 23, cast to be removed. I understand that I will now be booted and set my first appointment for physical therapy to get me mobile. It's been a really trying experience. You will need assistance at home. Bathing with a cast, using the rest room, being immobile and getting around when necessary has been difficult. Excessive strain on the opposite leg is causing knee pain and muscle aches in that leg. Age and previous physical condition plays a large role in recovery also. I am looking forward to the next step. I will not take mobility for granted ever again. Bring on the physical therapy, let's get moving. I ruptured my left Achilles tendon in a freak accident at golf driving range. I didn't know what I had done. I actually went to Disney World and walked 5 to 10 miles every day on a ruptured Achilles the next week. I limped, but not much pain. I decided on non-surgery protocol after MRI, but waited 2 months before being put on cast. Again I didn't know what I had done. I was back to normal activities within 6 months. Now 3 years later back to 90 to 95 percent strength. Although most people told me to have surgery, I found a specialist that said the conservative treatment was an option and I am happy with my results. My Achilles tendon tore while playing volleyball. I thought someone had stepped on the back of my shoe, everyone heard a pop and I was suddenly on the floor for seemingly no reason. When I tried to get up I knew something was wrong, it felt like I had nothing to hold my left foot up. Injury happened on March 16th and I had surgery on March 20th to repair it. I had a very large splint for the first two weeks, then a cast for another week, so was on crutches till April 9th and then finally a walking boot with several wedges. I weaned out of the wedges gradually and finally wore the boot for the last time on July 2nd. I did physical therapy for a while then used the therapy pool, which seemed to help a great deal. It is now September and I am back to walking on the treadmill and have been doing yard work, push mowing the lawn even while in my boot. Don't think you can't go on with normal activities, exercise will only help the strengthening process. I had my last checkup on August 12th and my doctor is very pleased with my progress, although he said no more volleyball; I guess 59 maybe pushing it. I don't wish this on anyone, but you can regain normal activity with proper care. In the best shape I had ever been, I was playing volleyball although at the time of the Achilles tendon rupture I was literally just standing. Now 6 weeks later, rupture repair surgery and two further surgeries due to infection, I am still having trouble with the wound healing from the infection. I will be out of my cast and into a boot tomorrow as my ankle is starting to freeze. Meantime I am waiting for the skin to heal and may need further surgery and a skin graft if it doesn't. I am a 65 year old male whose Achilles tendon snapped while running forward for a tennis ball in the 2nd set of a match. I had surgery 1 week later and have been in a cast now for 2 weeks. The original splint applied in the emergency room prior to the surgery was replaced for 2 weeks after the surgery. The hard cast was applied 2 weeks later. Here I am in plaster 2 weeks after my operation for a ruptured Achilles tendon. I see the doctor tomorrow for my post operation visit, the first time in my life I am keen to see a doctor. I only hope the cast can be removed and I get more mobility. I understand the recovery process is a long one but the past 2 weeks have been a drag. Whilst it is a long recovery I have been pain free and for that I am grateful. It is more a nuisance than anything else. Until tomorrow. I fell while walking and transferring quickly from the sidewalk to the roadway. I was diagnosed an almost full Achilles tendon rupture 25 days later. I am a healthy individual. I train at the gym 3 or 4 times a week. I am now limping. It is hard to find an orthopedic surgeon who deals with this kind of injury. Forty one days after the accident I am still waiting for an expert opinion of my wound which is treated so far conservatively. I have no pain now but I am still limping and walking slowly and carefully. It is the first accident of this kind and I don't know if I should have surgery. After having my neck fused, beating cancer, now I have torn my Achilles tendon off, all in the last five years. One week into this and I all I do is relive the morning it happened. This seems to me at this point the worst thing I have gone through. I just can't deal with the fact, I can't do the things I used to do. I guess if you all got past this, I can. One step at a time, and need to remember I am better off than many others. 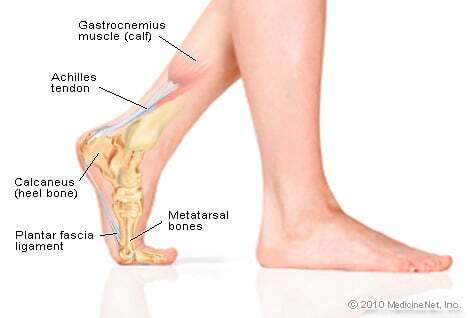 I had no pain in my heel after a ruptured Achilles tendon and walked and ran for 4 more weeks. Now I'm in a cast, ankle area was swollen all the time. I will have MRI this week.